Our Electronic Health Record (EHR) system is more than a way for your practice to go paperless. Our technology is a means to save money, improve efficiency and enhance security. Using industry standard technology, the Pandanis EHR will help your practice achieve your goal of accuratly capturing and effectiently managing patient data . Access clinical content - All of your practice data is at your fingertips, whether you’re in the office, an exam room, or at home. Manage medications, access labs and test results, clinical decision support, and patient education materials are just some of the types of information available in an instant. Communication – Pandanis EHR makes it easy to send and receive information - whether it’s an alert to a colleague down the hall, a referral to a specialist, exchange of data with a hospital, or an exchange with your patient. Unification - The EHR is just one part of the Pandanis Flexible Collaborative Medical Record Solution. All products were developed by one company and will function as one powerful system. For specialists, Pandanis flexibility allows it to cater to ANY specialties and sub-specialties. Providers will receive specialty-specific tools developed with the input of physicians. The system is flexible enough to allow any facility to modify the environment to meet their unique requirements. Electronic prescribing is also available via our partner Emdeon, who has connections to more payers, providers and vendors than any other healthcare business in the marketplace. Pandanis is a fully unified EHR/PM system that has all of the functionality needed to support practices and enterprise groups of all sizes and specialties. 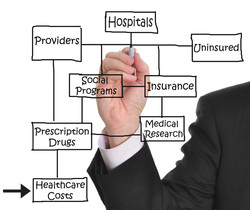 A single database is used to link patient demographics and medical records to insurance, billing, and claims data. Our features raise the bar of EHR, elevating the role of the system from passively collecting information to actively helping providers give the best medical care possible.